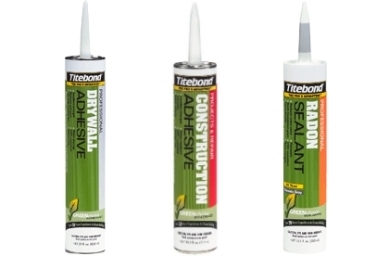 Titebond and associated company Franklin have stayed in the forefront in the woodworking, handyman, and the professional contractor markets with their reliable adhesive products. The evolving family of woodworking glues, Titebond I, II, and III, are extremely popular with woodworkers, cabinetmakers, and journeyman carpenters. Adhesives are indispensable in commercial and residential construction as well as remodeling jobs. And even though they perform well, VOCs (Volatile Organic Compounds) are offensive to the nose and cause health problems in some individuals. Solvents are components infused into the glue that are designed to enhance performance. Unfortunately, they also boost VOCs. VOCs are a family of chemicals. They may cause health problems both immediate and in the long-term. EPA scientists estimate that theyre up to ten times more concentrated inside than outside. It logically follows that the newer your home is, the more concentrated off-gassing VOCs will be. Theyre not just from glue, by the way; paint and carpeting are also culprits. This adhesive company's scientists started the work of eliminating hazardous solvents back in the 80s operating under the name of Franklin International. Then in 1989, they began to market a line of glues which were the first in their industry to pass AFG-01. Wooduniversity.org defines AFG-01 as "A performance specification developed by APA for glues recommended for use in the APA Glued Floor System. AFG-01 requires that glues applied at the job site be sunlight resistant, strong under many moisture and temperature conditions, and able to fill gaps." Just a few US states currently follow commercial and consumer VOC laws but national EPA rules are projected to be lined out and enforced in 2010. Our neighbor Canadians are taking the approach of phasing in environmental regulations by category: architectural coatings first, then automotive refinish coatings, and finally surface cleaners. Weatherproof Subfloor Adhesive. Unlike the days of old, all credible home-builders use screws rather than nails with a subfloor glue when initially installing or or later repairing subfloors. It not only helps with the grab, but also does away with the issue of squeaking and popped nails. Premium Polyurethane Construction Adhesive. Developed for interior and exterior applications, it stays workable even when the temperature approaches freezing. Also, there are no ozone-depleting chemicals involved. Titebond Solvent Free Clear Pressure Sensitive Adhesive. A latex-based, clear, thin-spread composition thats used for laying foam-backed parquet floor tiles as well as asphalt and vinyl tiles. Being user-friendly, it cleans up in a snap with water. Heavy Duty Construction Adhesive. Choose this one for hanging drywall in tight spots and attaching materials where you just cant get in with nails and screws. Unlike Liquid Nails, it cleans up with plain water. Professional Radon Sealant. Got radon? If you have a basement, chances are that you might and radon testing is a good idea. This sealant is formulated to keep this invisible, toxic gas out. Use it at foundation penetrations, and on foundation cracks and joints. Not only does it dry fast, but its also mildew and mold resistant. Professional Cove Base Adhesive. This is a common choice in commercial construction but is great in the home as well. Use it for applying vinyl and rubber cove base. It sticks well to most common wall surfaces like drywall, tile, wallpaper, and even paneling. Acoustical Sound Sealant. When a STC (Sound Transmission Class) value is specified, this is the product to use. Home theaters and recording studios are typical places where its used. Its also helpful in situations where one or more family members do shift work. Titebond WeatherMaster Sealant. The next generation of sealant, it surpasses non-VOC compliant urethane and silicone sealants in performance. Use it for a reliable seal around windows and doors. Its available in over 200 colors to match popular siding colors although it may have to be ordered from your dealer. Please post in the comment box below if you have an experience with these products that would benefit our readers.